In March 2002 and 2012 the Devizes Church Community came together under the auspices of the Devizes Partnership of Churches to perform a Passion Play. The next performance will be in 2022 and every ten years thereafter. 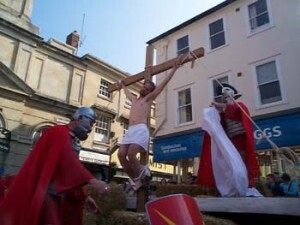 Members of most of the churches were involved in one way or another with this production which was performed as a promenade performance through the streets of the town, starting on the Green with the arrest of Jesus and culminating in his crucifixion in the Market Place in front of an audience of about 1000 people.